WIRED 9 TFT LCD HOME VIDEO INTERCOM SYSTEM. 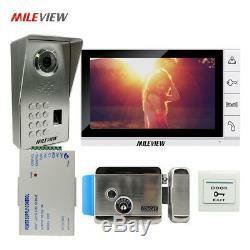 700 TVL Camera, Clearer Video! Unlock via Code, Fingerprint and unlock button. Upgraded chips are adopted for highly stable performance and it has a nice appearance. It is your perfect choice to use in villas with 700 lines CMOS camera, which can achieve monitoring, dual-way intercom and unlocking. You also can monitor outside image even without people pressing the Monitor button on the Indoor unit. Luxury Fingerprint recognition/Password unlock waterproof(IP65) CCD 700TVL outdoor Camera (The outdoor camera can put in the rain directly, no need rain cover). Support to connect a lock with the monitor. The monitor output 12VDC unlock signal. 9 TFT Hight resolution Color screen. Door answering, monitoring and Unlocking. Adjustable color, brightness and volume. Feature of outdoor unit: (Fingerprint recognition/Password function). The fingerprint outdoor unit is controlled by fingerprint sensor and code, it is internal integrated with the visual intercom circuit to connect indoor monitor. And use it to intercom, and unlock the door. Material: Aluminum alloy front panel, stainless keys. Unlock way: 4 ways to unlock (Indoor monitor remote unlock, fingerprint unlock, password unlock, keys etc). This system supports all kinds of 12VDC lock. Waterproof function: IP65 waterproof function. 6 Infrared LED night vision for night monitor. Blue LED backlight for digit keys. Waterproof (IP56)/Can put in the rain directly. Unlocking type: Relay N/O, or Relay N/C , 12V for option. This is a 110V-260V Access Control Power supply, it is made up of high quality electronic components and advanced international technology, it has anti-interference ability, provide very stable and reliable output in a various applications such as lock control/ controller control/ exit button/ RFID-ID Reader. It controls electric lock directly. Can reduce the load of access controller, save wiring to reduce the hidden trouble. Operative device: E/M Lock, Access Controller, Exit Push Button. This is a 12V Electric Lock Rim lock, unlock electronically or by hand, flexible switch, low electricity consumption. This Door Locks fit for different kinds of doors. 210mm(L) x 115mm(W) x 43mm(H). 9 LCD Digital 16:9 Display. Less than 6W, standby less than 0.5W. 255mm(L) x 155mm(W) x 23mm(H). In individual countries, which may affect how quickly your product is inspected. Of your receipt of the items for any reason. Please inform us in writing within 30 days of receipt of goods. If you receive a not-as-described e. We will arrange a replacement as soon as the case is confirmed. We will do our best to solve any problems and provide you with the best customer services. The item "Fingerprint Code Keypad 9 Video Door Phone Intercom System Electric Door Lock" is in sale since Wednesday, December 6, 2017. This item is in the category "Home & Garden\Home Improvement\Home Security\Door Entry Systems & Intercoms". The seller is "joinlgo_sally" and is located in . This item can be shipped to North, South, or Latin America, all countries in Europe, all countries in continental Asia, Australia.